Because my only brother moves to London (today!) 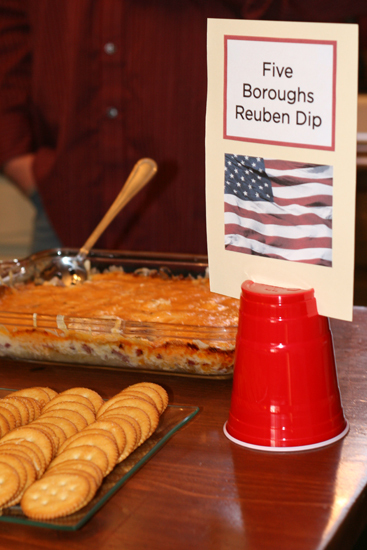 and because he loves Reuben sandwiches, we prepared a similar dip to serve at his going away party last weekend. We all visited Andrew in New York City for Easter 2008. It was then he introduced us to Katz Deli in the Lower East Side. Established in 1888 by a Russian immigrant family, the deli serves very large and yummy sandwiches. I’m not kidding — the “cutter” piles at least 1 lb of pastrami, salami, and corned beef onto stacks of rye bread. It’s ridiculously simple and incredibly savory. And I’m not even a fan of sauerkraut (though Nick can’t get enough of it). 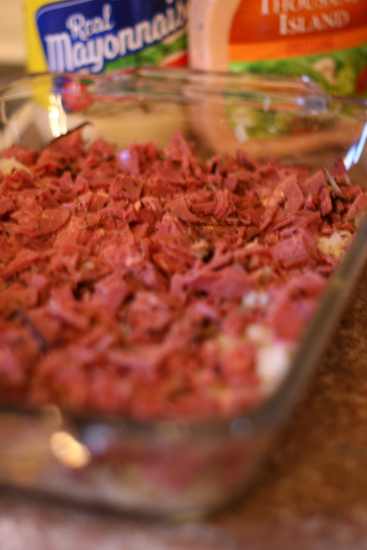 We assembled one 9×9-inch dish with corned beef and one 9×9-inch dish with pastrami. (We all preferred the pastrami, freshly sliced from the market. Hand-grated Swiss cheese makes a big difference, too.) The dip was served with Ritz crackers, but is absolutely edible by the spoonful, too. In a small bowl, combine mayonnaise and dressing. Spread sauerkraut into a 9×9-inch baking dish. Layer corned beef -OR- pastrami, Swiss cheese, and mayonnaise-dressing mixture on top of sauerkraut. I am happy to have found another cooking couple site!!! It looks like you prepared quite the yummy feast for your brother’s going away party! We are going to have to try the pretzel bites- yum!